As many localized Internet-based businesses – those responsible for everything from your eco-friendly, hand-varnished bamboo iPhone case to your custom-ordered monthly shaving kit – continue to produce some of the most enviable commodities on the market, their throwback sensibilities are clashing with modern industrial growing pains. While these businesses tout their meticulous, artisanal production techniques as mission statements, their practices are strained by growing consumer bases and their need to expand manufacturing accordingly. Last Thursday’s Design Manufacturing Summit began panel discussions with a roundtable including Jessica Banks, Cliff Baldwin, and Bob Bland, all entrepreneurs and designers who have been grappling with scalability as they try to build better, ethnically-minded products. Bland, founder of NYC-based factory and fashion incubator Manufacture New York, started the conversation by underscoring how communal efforts keep her service for aspiring designers – as well as designer clothing production – afloat in the city, describing the small but impassioned spirit carrying it and similar ventures as a “domestic manufacturing revolution.” As most fashion companies outsource labor overseas, Bland said that the designers who chose to stay local could only do so by pooling their efforts, a reality that inspired her to build her membership-driven factory where aspiring creators can conceptualize and produce small runs of one-off lines. “We have a grassroots organization of people who know that they want to be there,” she said, referencing the dedication her clients displayed from the outset. “Making is trending right now, but it’s not totally sustainable, if you don’t have people around you,” said Banks, whose “engineering boutique” RockPaperRobot’s forays into tech-inspired and –assisted furnishings have caused the outlet to explore larger manufacturing options. Banks noted that this new wave of American manufacturing has caught the attention of larger companies like General Electric and Target who are “re-shoring” efforts stateside and collaborating with local producers while providing greater outreach for them. “We can innovate in ways that they can’t, but they want access to,” she said. Baldwin noted that there are still neighborhood resources throughout the country that go unused from outsourced production, recounting his inadvertent discovery of New York’s aluminum spinners, who have access to hulking, factory-grade machinery. 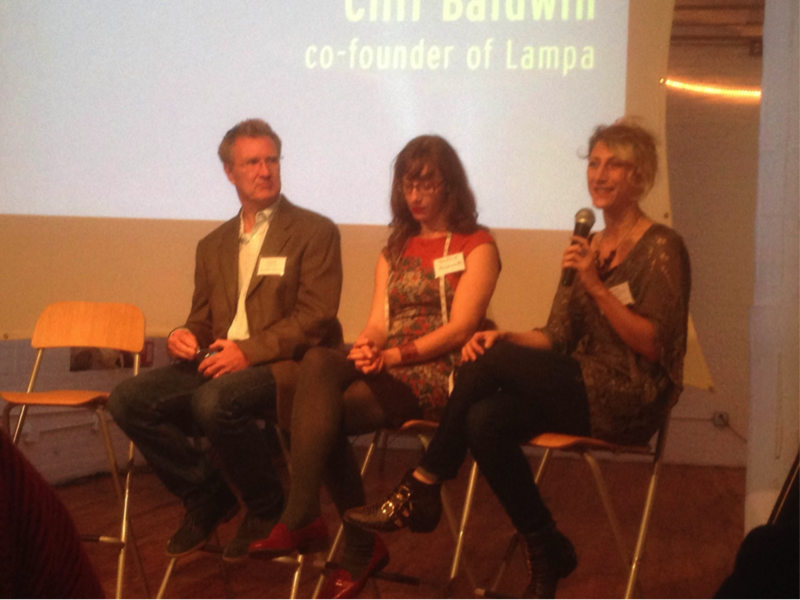 Baldwin, whose company, Lampa, produces custom, locally-sourced light fixtures for homes and commercial venues, asserted that continuing to utilize such immediately available tools can help domestic businesses to gain the upper hand over outsourcing, through a greater lead time in production. “The whole country is in this shift where everything’s on demand,” he said, mentioning that retailers are increasingly placing quicker, smaller orders, often meeting startup manufacturers on its terms. Towards the end of the panel, Bland reaffirmed sustainability as a practical guiding philosophy for startups as they grow. “Do people need that many of one thing? That’s worth thinking about as you scale up,” she said. While Banks expressed the breakthrough potential that technologies like 3D printing can offer to increase customization and the accessibility of goods at a larger level. For now, Bland hopes that providing steady work through incubators will allow those with the ideas and the talent to support themselves through their dream jobs. During the summit’s keynote, legendary production studio R/GA’s Jonathan Greene elaborated on the company’s own take on an incubator: their recently announced “Connected Devices Accelerator.” Looking to foster the next great device that marries hard data with unified consumer services, R/GA will offer 10 startups upwards of $120,000 dollars in funding and three months to develop said product, outfitting them with a network of mentors, including venture capitalists and designers, and a full suite of R/GA creative resources, including 3D printers, in-house critiques, and NYC office space. The session will conclude with exclusive demonstrations in NYC and at South By Southwest next year.